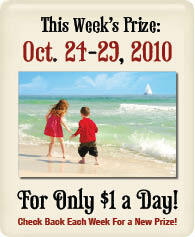 Final Prize on September 28 to be the Largest in ResortQuest's Beach Vacation Treasure Hunt Contest. Winner Will Spend a Five-Night Stay in a Seven-Bedroom, Six-Bath Vacation Home with Water Views, a Private Pool, Outdoor Cooking Area, Two Living Areas and Two Master Suites. Fort Walton Beach, FL (PRWEB) September 26, 2010 -- On Tuesday, September 28, ResortQuest will offer one final opportunity to win a luxury beach vacation for just $1 a day in their popular Vacation Treasure Hunt contest. And, this last vacation prize promises to be the most valuable of the entire beach promotion. "The Vacation Treasure Hunt has been such a hit all summer, and we wanted to finish strong," says Cheryl Spezia, vice president of marketing for ResortQuest. "I don't want to reveal too much, but I will say that our final prize will be worth the wait." Each week, the company keeps the location of the stay a secret until a winner finds the prize on the Web site. While they're not revealing the location for this week either, ResortQuest is divulging a few tantalizing hints about the prize property. The final prize in the Vacation Treasure Hunt will be a five-night stay in a seven-bedroom, six-bath vacation home that offers room for 22 guests -- a $5,600 value. This amazing vacation property features water views, two living areas with fireplaces, two master bedrooms and master baths, and a complete outdoor cooking area overlooking a private pool. ResortQuest, a leading vacation rental management company, has awarded 25 beach vacations over the course of this summer's contest -- each a five-day stay in one of the company's professionally managed condominiums or vacation homes in Northwest Florida, along Alabama's Gulf Coast, on Charleston's Islands in South Carolina, or along the Delaware Coast. To play, contest participants navigate through ResortQuest's beach destination Web sites, solving clues and searching for a hidden treasure map icon. The treasure map reveals a toll-free number and promotion code needed to call and claim the prize. The final contest will start this Tuesday at 2 p.m. EDT. To learn more about the contest rules and how to participate in ResortQuest's Vacation Treasure Hunt, visit www.VacationTreasureHunt.com. Contestants are also encouraged to become fans of ResortQuest on Facebook or to follow ResortQuest on Twitter to get contest reminders and instant updates each time a new Treasure Hunt clue is released. For more information about ResortQuest, contact Cheryl Spezia at 850-362-4008 or toll-free at 800-862-4853. Headquartered in Fort Walton Beach, Fla., ResortQuest is the largest marketer and management company of vacation condominiums and home rentals in the nation, with a portfolio of nearly 10,000 U.S. vacation rental properties. With partner affiliates in North America and Europe, ResortQuest offers more than 100,000 vacation rental options in over 140 destinations worldwide.